Tom Cover, class of 1960 recently chaired a fundraising effort in his local community, St. George Utah. 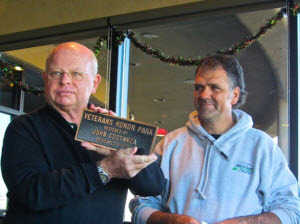 Cover, also a Marine Corps veteran lead a program to design and construct a Veterans Honor Park, which was dedicated on 11/11/11 at 11:00 AM. A full ceremony with music, motorcycle guard, marching, presentation of colors, speakers, and culminated with the raising of the flags and a flyover. It was well attended by over 600 residents. The park is a place for quiet reflection and is enjoyed by the community in St. George, Utah.